Grilling is a great American tradition, a part of the American fabric, that thing you just need to enjoy in your lifetime. Whether you live in a multi-family residence or an apartment complex, you 'want in' during barbecue season at least. In this post, we'll deconstruct America's love for grilling, and discuss grilling safety and tips as they apply to a commercial setting. 75% of Americans own an outdoor grill or smoker. Fourth of July is the most popular grilling holiday in the calendar year, with a whopping 87% of Americans lighting their grill. The next popular ones are Labor Day, Memorial Day, Mother's Day and Father's Day. 63% of owners use their grill throughout the year, while 43% use it at least once in the winter months. Men are more enthusiastic about grilling than women, though more women like to experiment during their grilling sessions. Hamburgers are most often cooked; others include chicken, steak and hot dogs. While many barbecues are scheduled for afternoons & evenings, a fair share - 11% of grill owners - also indulge in BBQ breakfasts. The most popular reasons for outdoor grilling include : personal enjoyment, flavor enhancement, socialization, and entertainment. The main barbecue styles people attempt are Texas, Memphis, Kansas City and Carolina-style. Gas grills are the most preferred style, using propane or natural gas to conveniently fire up and cook without requiring the preparation time and clean-up that charcoal grills require. Though purists will argue that the flavors delivered by charcoal are hard to beat, the difference between the two is not significant. Gas grills can have anywhere from one to five burners. The grilling surface may be comprised of stainless steel sheets, porcelain covered steel bars, stainless steel bars, or iron gates. Top rated products in this category include the PSG A-Series and T-Series Grills. The A-Series grills are engineered from permanent mold aluminum, commercial superior quality stainless steel, brass, and porcelain on steel components. Grills in this range are priced according to their BTU rating and cooking surface area. The T-Series is built with the highest levels of reliability and safety for a commercial setting. Durable materials withstand the rigors of daily use. The 60 minute gas flow timer shuts off gas flow, if the grill is accidentally left on. It is a safety precaution against potential safety hazards that arise when users forget to turn off the gas supply after they've finished using the grill for the day. PSG also offers built-in options for grills such as access doors, drawer storage sets and beverage centers. Open flame cooking devices cannot be used on combustible patios, decks or within 10 feet of structures. Apartments equipped with automatic sprinklers on the balcony or deck are exempted from this above rule. Some rules also apply to gas grills, so it is best to understand what you can and cannot do in and in the immediate vicinity of your home. Apartment residents have found it best to just use the community grill that's usually located in a common area at a safe distance from the buildings. A nice BBQ is just a few steps away, so you don't have to carry your stuff elsewhere or explore other options. The golden rule of grilling is “never leave your grill unattended”. This is especially important when you have kids playing in the immediate area. When you have to take a break from cooking, request someone else take to your place. Fires from gas grills are mostly caused due to obstructions in the path of the fuel. It may occur inside, under or in a place behind the grill, where we tend not to look. 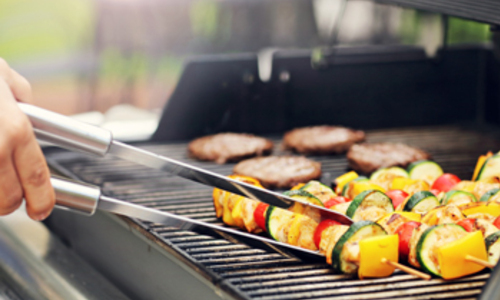 It is important for property managers to inspect the gas grill for problems; this also includes bugs and insects that can affect the flow of gas. When a problem is identified, turn off the control valves and fuel tank before examining the grill. If, for any reason, the community grill is unused for a period of time, check it for leaks, correct assembly, deterioration, and obstructions to the burner prior to reusing it. Remember not to add too much propane into the cylinder. The LP cylinder must be filled to 80% of capacity. As the liquid expands, it must be allowed some space. The cylinder valve outlet must be plugged when the cylinder is not connected to the grill or it is being hauled. This doesn't apply for quick connect or close coupling cylinder valves. Always keep the lid open when lighting a gas grill; this will prevent gas-build up and the flash resulting from it. Instruct amateur users not to lean over the grill when cooking. It is a bad idea to add too much food on the grill. It creates the risk of too much fat (from fatty meats) dripping on the flames and causing a flare. Minor flares can be handled with water (keep a spray bottle within arm's reach), but larger ones can cause panic. Always check that the propane tank is properly connected. Turn the propane off after using the grill. PSG's T-Series counters this risk; however, if you're going for a different series where the timer feature is unavailable, set a mental reminder. Clean grates to remove the grease and build-up. As a community grill user, be mindful of cleaning up after the cooking and eating is done. That way, you'll always have a clean, safe and desirable shared space to return to on your next BBQ outing. A commercial grill must be "seasoned" before it's first use. Seasoned grates get hotter quickly and cook more evenly. The purpose of "seasoning" a new grill is to remove traces of contaminants such as dust and metal shavings from the manufacturing or shipping process. Seasoning a new grill also seals the pores. The grates that need seasoning are: stainless steel or cast iron grates and their emitter plates. With the grill off and the grates cold, coat all the surfaces of emitters and grates with peanut oil, canola oil or any other high-heat cooking oil. Coat the grates evenly with the oil. Use a paper towel to wipe the excess oil. Turn on and heat the grill for 15 minutes or until the oil starts smoking. The shiny finish will turn bronze or dark brown. Let the grill cool, and then apply a light coat of oil after each use to protect from rust. You may also want to give the grill a good cleaning from time to time. Read the owner's manual for instructions on grill cleaning. Some commercial grills can be cleaned with a grill brush while others warn against any abrasive cleaning tool or product, and require special cleaners and soap cleansers. One of the simple pleasures of life is biting into a succulent piece of meat cooked exactly how you want it. The cornerstone of a good barbecue is the meat itself. You may already be a pro at picking the best meat for grilling, or you may have little experience grilling meats. In either case, it won't hurt to go over the three rules of picking out meats for grilling. Color: Healthy stakes with zesty flavors are deep red in color and don't have brown or gray spots. Marbling: Marbling is basically the fat in a cut of meat and between muscle fibers. Scrutinize the meat for white streaks of fat – the more the marbling, the more flavorful and tender the steaks. Thickness: Thinner steaks may not always cook evenly, and tend to become dry and therefore tasteless. It is better to choose steaks that cut a minimum of 1 inch thick. If you're keen on purchasing the best quality meat, choice meat is a good option to consider. It has a good amount of tenderness and marbling, and is not expensive. Prime meat is the pricier option, but you pay for quality as just two out of 100 cows actually give prime meat. Select meat – though cheap – cannot match the taste delivered by the other two quality grades. There is no reason why you shouldn't be able to hone your BBQ skills on your community grill. Besides knowing your way around the grill, it helps to be aware of the basic grilling gear. They include: meat fork, spatula, tongs, carving board, marinade brush, meat thermometer, and meat slicing knife. Of course, a BBQ is incomplete without accompaniments such as sauces, marinades and rubs. There are dozens to explore – whether you plan to buy them off the shelves or whip them up in your kitchen. A public grill creates opportunities for social interactions in a way a private one cannot, so utilize your apartment’s grills, and throw a barbecue!